1) Support Indian Children: The Indian Child Welfare Act is supposed to protect Indian children from being taken away from their Nations. It was recently found to be unconstitutional in Brakeen v Zinke. The ruling was based on state rights, ignoring tribal sovereignty, and viewing Indian status as racial only, and not based on the legal/political relationship between Indian Nations and the United States government. If this is upheld at the Supreme Court, Indian children will be fair game for states in collusion with private adoption agencies to legally kidnap Indian children. The grounds of the ruling would also open the doors to usher in a new era of Termination, annihilating Tribal Sovereignty. Further, over 14,000 children are being held in prison camps on the southern border of the United States, most of whom are Indigenous. These children are virtually forgotten, and pressure needs to happen so this crime against humanity is stopped. 3) Strengthen Inherent and Indigenous Sovereignty: Nation-states, including the United States, are undermining inherent sovereignty and self-government by relegating self-government to nothing more than self-management. Corporate and municipal structures are the structures of choice. This is nothing more than Termination under various guises. The nation-states of Australia, Canada, New Zealand and the United States have formed an alliance called CANZUS that coordinate together in advancing a common public policy objective to achieve this goal. We re-affirm our unwavering commitment to the assertion of our inherent sovereignty and self-government as Indigenous Nations, in a way that is inclusive of our own laws, values, customs and traditions. Indigenous Sovereignty is not defined by non-Indigenous laws, rules and regulations; nor by economic development, good governance, and corporate structures. These elements may be pragmatic, but they do not define us. We also specifically support tribal sovereignty and the relationship between Indian Nations and the United States as being nation to nation and not merely government to government as it is often wrongfully characterized. Underlying all of this is a long history of a bilateral, bi-cultural relationship based not on equality but rather on principles of equitability. This means that the relationship recognizes each other as being of the same status, but maintain their distinct identities. Indigenous ideals relating to sovereignty are not just about power and control but are also about responsibility and respect. This places obligations on Indigenous Nation citizens to practice traditional and customary responsibilities, rooted in Indigenous Knowledge, including the protection of our relationships with our respective lands, waters, animals and plants. This concept of Indigenous Sovereignty has been severely challenged by a long history of manifest destiny, genocide, and land loss. It is essential that we as Indigenous Nations actively reassert the practice of Indigenous Sovereignty on the one hand while mounting challenges legally and politically on the other. 4) Create an Environmental Covenant: As Indigenous Peoples, we have a responsibility to be caretakers for the environment. That responsibility falls upon our respective Indigenous nations regardless of contrary nation-state policies and laws. We therefore commit to the creation of an Environmental Protection Covenant to be agreed to by Indigenous Nations that set minimal standards in regards to any developments on or in watersheds and traditional territories surrounding our respective Nations. 5) Repeal Public Law 280 and Overturn the Plenary Power Doctrine: Public Law 280 is a relic from the Termination ere of the 1950's. It gives criminal and civil jurisdiction over certain Indian Nations to certain states. We support the repeal of this law and expect appropriate resources to be provided to transition back to Indian Nation jurisdiction. The Plenary Power doctrine is a legacy of judicial racism that was established in a legal decision called US v. Kagama (1886). Under this doctrine, Congress has unilateral authority over Indian Nations. The Dawes Allotment Act, the Termination policies, and all the other acts of Congress against Indian Nations since this time have been done under the Plenary Power doctrine, where Indian Nations cannot legally contest the constitutionality of these acts. Recognized Indian sovereignty literally exists at the whim of Congress. In these times, this is especially worrying. We are committed to asserting our sovereignty despite any actions by Congress that would otherwise be unconstitutional, and to developing strategies to overturn this racist doctrine. 7) Treaties, Lands, and Customary Responsibilities: In the United States, Indian Nation authority does not just extend to the boundaries of the reservation, it extends over the respective traditional territories. This includes treaty lands and un-ceded lands taken without consent. This authority extends not only to hunting, fishing, food and medicine gathering, but also to our sacred sites and protection of our watersheds. Any process of consultation is always going to be inadequate because it means that the ultimate authority will always rest with non-Indians. We are more than capable of understanding and making decisions on development issues in our traditional areas. We also note the recent decision by the Supreme Court of Canada in the case of Tsilhqot'in Nation v British Columbia 2014 SCC 22 (2014). In this case the Tsilhqot'in Nation was found to have proved that they had retained aboriginal title over a large part of their traditional territory and were therefore found to have consent authority over timber harvesting in this area. We assert that the same principle should be adopted here in the United States, recognizing the consent authority of Indian Nations for developments impacting upon hunting and fishing rights and responsibilities, food and medicine gathering rights and responsibilities and engaging with sacred sites and Ceremonial grounds. 8) Strengthen and Assert Spiritual Freedom: The legal assaults on Indian spiritual beliefs and practices have increased over the last few decades. Despite the American Indian Religious Freedom Act 1978 requiring federal agencies to respect Indian spiritual practices, these same agencies ignore and actively oppress Indian spiritual practices. For example, the US Army Corps of Engineers, in supporting the DAPL pipeline, actively supported the Morton County Sheriff Department in preventing Indian people from praying on land under their alleged jurisdiction. Much of the militarized action undertaken against Water Defenders was in fact in areas under alleged federal jurisdiction, and primarily involved suppressing freedom of religion. There are also a number of court decisions, such as Lyng v Northwest Indian Cemetery Protection Association (1988) which creates a weaker standard for First Amendment protection of Indian spiritual beliefs and practices. 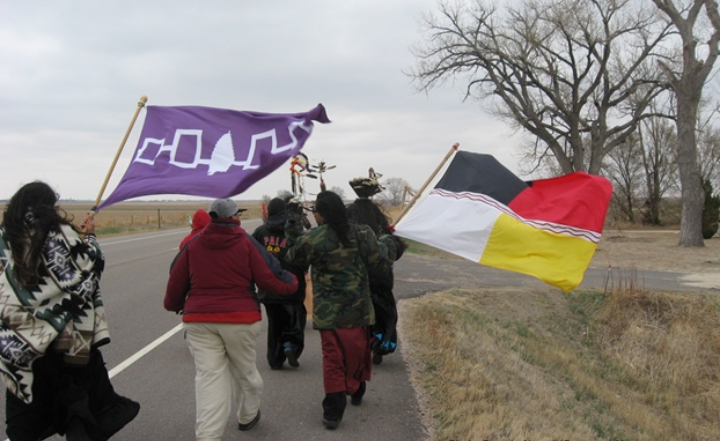 We are committed to actively asserting out spiritual ways in our lands, whether on or off reservation, and see this as an essential responsibility. We will assert these responsibilities on our sacred sites and Ceremonial grounds as part of a living practice, and not as some relic of the past. 9) Indigenous Knowledge: Indigenous Knowledge which includes our spiritual ways, language, customs, traditional values, social structures, law, political structures and though are the very heart of who we are, is under significant threat. Basically, corporations and nation-states who have for generations attacked, undermined and minimized Indigenous Knowledge are now creating definitions which recognize it on their terms and in their context as a property right. What should never be defined under non-Indigenous ways of thought, is now being defined in various United Nations forums and such, in ways to foster development. This is really obvious on issues relating to carbon trading and carbon credits. To protect Indigenous Knowledge we advocate for a definition that is from a completely Indigenous Peoples perspective that is outside of property law. Without such a stand, those seeking to impose development projects upon Indigenous Peoples will be in a position to acknowledge that Indigenous Knowledge is harmed by the development, and can be taken with property compensation provisions. 10) Just Transition: The current economic system is not doing enough to address major environmental issues such as climate change. Often, Indigenous nations and communities are at the front end of development projects that cause harm. Just Transition is a way of finding ways to create sustainable economies of scale that focuses on renewable energy, and community health and well being. 11) Alcohol and Other Drugs: Alcohol and Other Drugs have played a major role in the subjugation of our Peoples and Nations. Alcohol, heroin and meth amphetamines, to name but a few, continue to wreak havoc and devastation. There is a need to strengthen our collective commitment to stop this cycle of addiction and abuse, that leads to shattered families and communities.